The LVT is an ultra-high resolution, continuous tone Film Recorder. It exposes digital files directly onto E-6, C-41 and B&W film. LVT is an acronym for "Light Valve Technology", which was the original exposure moderating mechanism when the film recorder was first introduced by Kodak. The LVT was originally designed by Kodak but they sold the business to Durst a number of years after they invented it. The current models (ie Rhino+) use Laser Diodes to expose the film, which gives a much nicer print. After the LVT business was sold to Durst, they improved the printers and software tremendously. The Durst LVT uses fixed optical resolutions when exposing the film. The resolutions are referred to as RES80. Lower RES's are available on the device but are not used for film. The RES is the number of pixels per millimeter (MM). RES80 is exposes the film at 80 pixels per millimeter or 2,032 pixels per inch (PPI). That really is a lot of pixels per MM! As an example, the LVT uses a 30x microscope to allow us to focus the beam. Even with the assistance of the 30x scope, you cant see the RES 40 or RES 80 pixels. The prints are so tight that you will never see the individual pixels on the print. They are truly amazing prints to see! The ultra-high resolutions are enhanced by the continuos tone nature of film. The LVT uses all films to its fullest potential. Continuous tone film recorders offer extremely smooth gradations and subtle transitions that are not possible on other devices. There are no dots as in inkjet prints and no scans lines as in CRT film output. 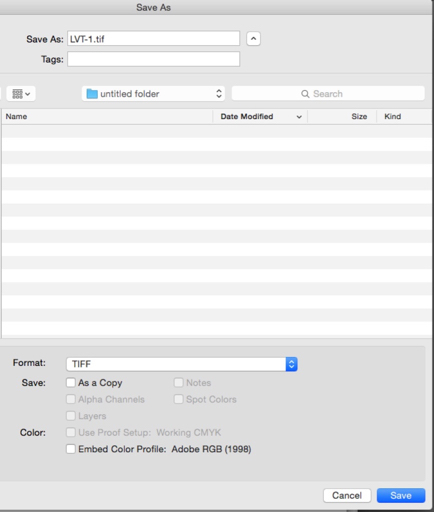 Create your files using the Adobe RGB 1998 profile, color correct and then save the file as an 8 bit RGB TIFFs (IBM Tiff format). The Tiffs must be flattened, no alpha channels with No Profiles Embedded. If a profile is embedded the LVT will reject the file. The actual imaging area on the LVT is slightly smaller then the nominal film size. Please take this into consideration when creating your file. Please use the table below. Exact 4x5" or 5x7” output requires 8x10" film. Make sure to indicate how you would like the file to appear ie. vertical or horizontal in a 4x5 or 8x10 if its small. Also indicate either a white or black background if the size of the image does not come to the edge. 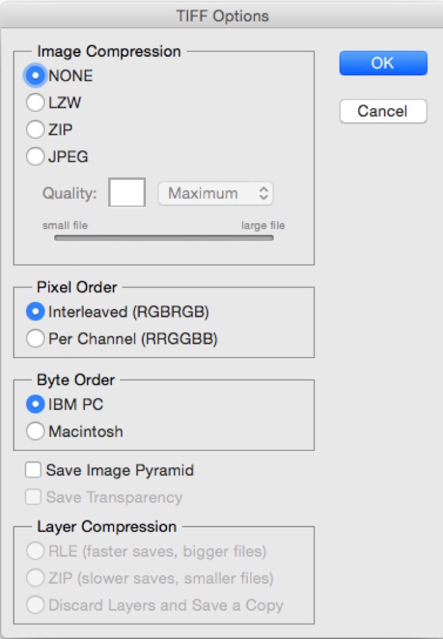 Create your files for the desired output resolution and film size. When creating the file for LVT Output, please size them according to the chart below. Note: RES40 is only for reference, we do not offer output at RES 40. The LVT Rhino+ can image files on Color Negative (C-41), Color Positive (E-6) and B&W negative films. If you require a different film stock, please Contact Us. We can potentially calibrate the LVT to any Color or B&W film stock and processing routine. The setup fee for a film stock not listed if you provide the film is $500. Please Note: A minimum of 5-10 sheets of 8x10 film is required to complete the calibration. The film should all be from the same emulsion lot. The film used for imaging the final files should also be the same emulsion lot. If we will need to source the film, the setup fee can be up to $1000, depending on how expensive the film is and how much we need to complete the calibration. B&W 8x10 Positives are also available, please Contact Us for more information. 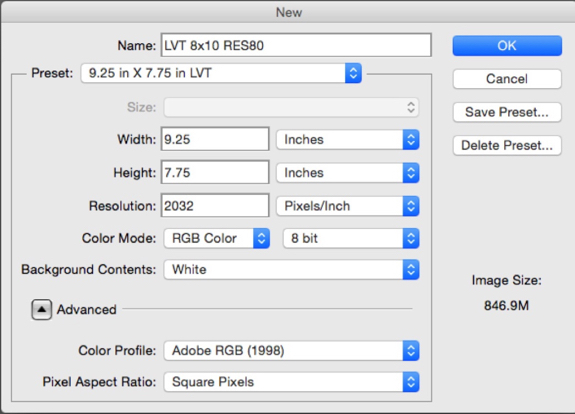 If you want to print 4 - 4x5s on an 8x10 sheet, they will be a bit smaller then a normal 4x5. The LVT has grippers to hold the film on the drum. Thus the active image area is a bit smaller then a normal 8x10. The active image area on an 8x10 is 9.25” x 7.75”. To make 4x 4x5s, you would have to make the 4x5s smaller. They should be 3.5” x 4.5” @ 2032 ppi. We have created a 4x5 4up layout Photoshop document to help with the placement. You can download the PSD file here. The file contains guide bars to help align your images. If you have any questions about the file, please contact us. Thank you for visiting our LVT Rhino FAQ. If you have any questions, please contact us anytime. All information contained on this page is ©2006-2017 Photographer At Large / PrePress Express and may not be reproduced without our written consent.